Fork slots for ease in fork truck transporting. Ramps may be stacked for compact storage when not in use. Fork pockets are 7-1/2" wide by 2-1/2" high usable. These fork pockets add approximately 15" to the overall width of the riser. Wheel Risers are designed to raise the trailer for loading and unloading to facilitate compliance with OSHA/ANSI B56.1 part 3 sec 7 requirements for maximum grade of ascending or descending loaded fork trucks. Made of heavy-duty welded steel construction. Uniform capacity per pair is 40,000 lb. (1/4" thick material) (sold each). Wheel Risers are priced and sold each. NOTE: Dual wheels on semi-trailers are 18" wide. The 24" wheel risers work best for this application. Easily move steel or aluminum risers out of your way with these handy caddies. Simple to use – just snap the roller into the riser. • For 18" wide wheel risers. • Includes one caddy and one pair of brackets. 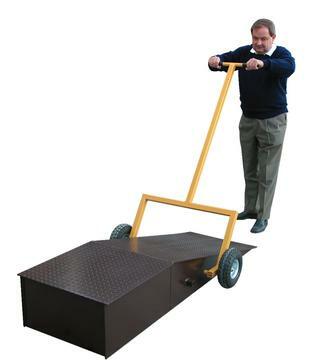 • Uses two 10-1/4"x3-1/2" pneumatic wheels (wheels not included). • For 24" wide wheel risers. • Includes one pair of bolt-on brackets and hardware. • Includes one pair of weld-on brackets and hardware. • Available only in lengths up to 72". Allows fork trucks to easily position and move two risers as one. Brackets (four per riser) to bolt riser to ground.